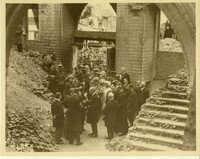 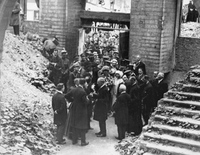 Date is exactly "1919 June 19"
President Wilson, Mrs. Wilson, and the King and Queen, entering what was once known as the world's finest library. 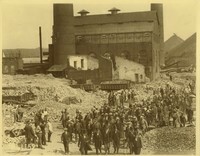 Destroyed by Germans. 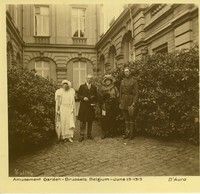 Picture reading from left to right; Her majesty, the Queen, President Woodrow Wilson, Mrs. Wilson and His Majesty, the King of Belgium. 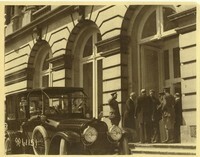 Picture taken at the Kings Palace in Brussels, Belgium. 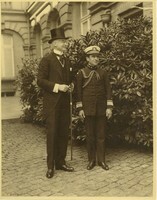 Photo of Cardinal Mercier, Malines, Belgium; taken during Woodrow Wilson's visit. 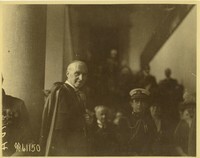 Cary T. Grayson featured in background. 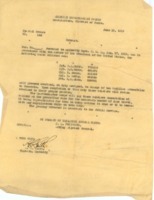 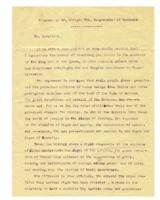 Harry S. Knapp sends Cary T. Grayson a report on Itialian occupied Dalmatia. 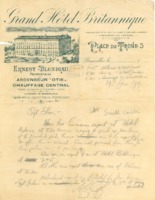 A report by Russell C. Leffingwell on the public debt.